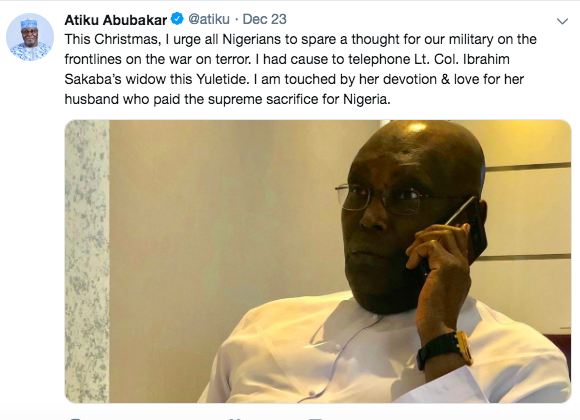 Former vice president and presidential candidate of the Peoples Democratic Party (PDP), Atiku Abubakar has said that he indeed did not speak to a slain officer, Lt. Col Ibrahim Sakaba‘s wife. Sakaba was among the soldiers killed by Boko Haram when they attacked a military base in Borno last month. 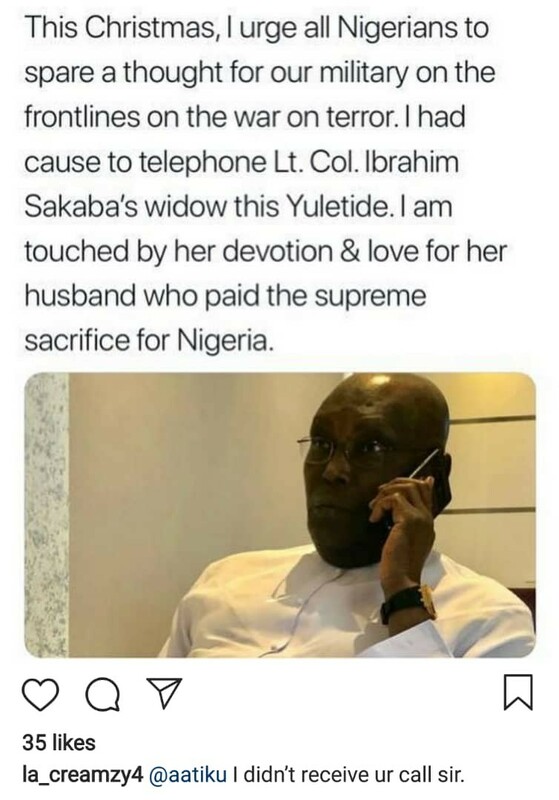 Atiku had released a statement on Twitter, saying he spoke to Sakaba’s widow but she quickly debunked the statement, writing on Instagram “I didn’t receive your call sir”. The statement from Atiku’s team said that the former vice president could not reach Sakaba’s widow but he spoke to his younger sister. “However, this communication was erroneously communicated. The error is regretted,” the statement said. On Sunday, the former Vice President tried albeit unsuccessfully to contact Mrs. Sakaba but was able to eventually speak with Maryam, younger sister of the gallant soldier during which he expressed his deepest condolences to the family. However, this communication was erroneously communicated. The error is regretted. Atiku Abubakar, however reaffirms his deepest condolences to the Sakaba family, which sacrifices, like those of their brave son, keeps us safe.